We visited the Houston area for a few days over Spring Break. 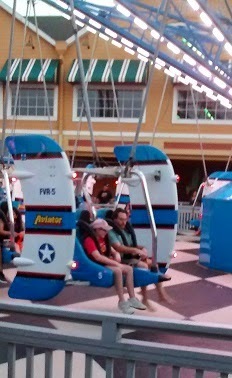 One of our outings was to the Kemah Boardwalk. It's a little old-timey amusement park located on the waterfront. While waiting for one ride to start, "Uptown Funk" came over the loudspeakers and all of the sudden, despite being strapped in and amidst thousands of people who may or may not have been looking at Diva & Engineer at that moment, those two started lip-syncing and dancing like they were the only two on the planet. Cost of a ticket to the two-man show? Priceless. Love it--such a fun memory, I'm sure! It was indeed Ms. Melissa!